We're back with another "Seven Questions" interview, and this time, it is one of the great legends of entertainment, Vicki Lawrence! Of course, sitcom fans know her most of all from her six season run on the series Mama's Family, which was a spinoff of a series of sketches from The Carol Burnett Show. But Lawrence is more than just Mama. As the legend goes, she was discovered by Carol Burnett at the age of 17 and became part of the legendary series, The Carol Burnett Show, becoming the only cast member to remain on the series (besides Burnett herself, of course) for the entire run. In the midst of this success, she also managed to find herself with a brief (but memorable) musical career, as she was the woman behind the famous song "The Night the Lights Went Out in Georgia" and other songs that made it big in other countries. 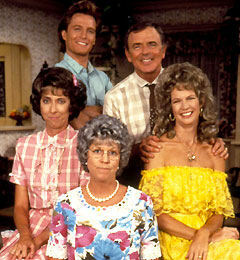 After the end of The Carol Burnett Show, she moved to Hawaii along with her children and husband Alvin Schultz (to whom she is still married to this day), but that didn't last long as Los Angeles came calling again with a few guest roles and eventually the call to do the series Mama's Family, which ran for six seasons on NBC and in first-run syndication (one of the first successes in first run syndication) from 1982 until 1990. She has also made game shows a significant part of her career, appearing on Match Game, Hollywood Squares, and many variations of Password and Pyramid, as well as hosting the NBC Daytime version of Win, Lose, or Draw in the late '80s. In the early '90s, she joined the leagues of Oprah, Geraldo, Donahue, and many others as she hosted her own daytime TV talk show Vicki! In more recent years, she has been seen with Miley Cyrus--not twerking, but playing her grandmother--on the Disney Channel series Hannah Montana and the voice of Flo in the animated video series Hermie and Friends. She is currently touring with her show "Vicki Lawrence and Mama: A Two Woman Show," where audiences get to see Mama in the 21st century. Just in time for the release of StarVista Entertainment/Time Life's Mama's Family - The Complete Series on DVD, we got a chance to talk to Vicki Lawrence about. So let's get right to another installment of "Seven Questions!" SitcomsOnline: It may seem difficult to choose among 130 episodes, but what were some of your favorites from the series? Vicki Lawrence: Oh Lordy… well, from the early episodes, I'd say part 2 of "The Wedding" because I watched the episode… that's the one where Eunice gets to sing at Vint and Naomi's wedding… and my supporting cast, Carol Burnett, Harvey Korman, Betty White, Ken Berry, Dorothy Lyman. I mean, how much help does one girl get? I feel you can really pause that DVD at any point and give people a television comedy history lesson. It's just an amazing supporting cost. Dear God, Carol was funny in that show! There was another early episode, "Rashomama," which was a takeoff of the Japanese film Rashomon, and Mama gets hit with a kettle in the kitchen and its me, Betty, Dorothy, and Carol, and Mama has to go to the emergency room and each lady has a different story about what happened in the kitchen, so we redo the scene three different ways, and it's pretty funny. That's of the early shows. There are so many good episodes. I loved when the family, this dysfunctional family, got sent out in the real world that we are aware of, like when we went on Jeopardy! or when we went on Family Feud. I loved in particular the game shows because people know the format of those shows so perfectly and to watch this crazy family get stuck in that format was just really fun to me. Probably because I also love game shows so much. I love "The Love Letter." It was a great episode, a record-holder actually. I think Bubba writes a love letter for Vint, who is having some problems with Naomi. In the course of the 22 minute episode, everybody thinks that the love letter is meant for them. Mama thinks it is for her from the repair guy who is there, Iola is sure Vint has written it to her. The show actually ran 22 minutes with no costume changes or anything. I remember the night that we did it, we did it in 22 minutes and were out at 7:25, and our director said "good night, you're done!" But honestly, I have to say, by the time we finished the show, we had it down to a four day workweek, so I kind of felt like we got paid to play dress up really. SitcomsOnline: Let's talk about some of the guest stars on the show. Who were some of your favorites? Also, I was wondering about Dorothy Van who played Aunt Effie. The series was more or less her television debut at a later age in life, so how did she become part of the series? 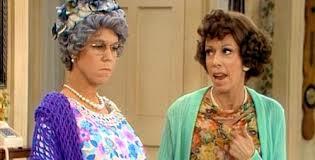 Vicki Lawrence: We had a lot of character actors on the show. You'll go back and see a lot of characters that you remember from other things. Brent Spiner was one of our very first episodes, I believe, as a neighbor and he went on to do Star Trek: The Next Generation. We kind of thought he was going to be a recurring character on Mama's Family, but there he went. Our Reverend, Reverend Meechum (Earl Boen), every time I see him I think of Terminator 2 because he was so good in that. So a lot of good character actors would come our way. It is interesting too, because a lot of guests who came our way would ask what period we were in, because they thought this was a period piece. I said "no, I think this is modern time in the midwest." As for Dorothy Van, She was Jim Evering's writing partner. She came with the writing staff, and she was just a funny little character so we put her in the show. 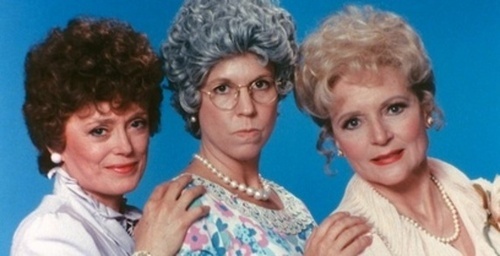 SitcomsOnline: Mama evolved significantly over the years, from a somewhat bitter and hostile woman in The Family to a warm, loving, yet still outspoken woman in Mama's Family in order to make her more sitcom friendly. Do you feel that Mama would be as loved and remembered today if she had remained similar to her original version? 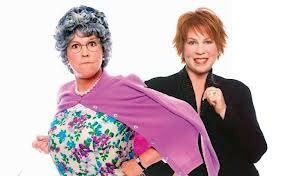 Vicki Lawrence: Oh, Mama had to change. We did about two episodes of the series, and it is interesting, Joe Hamilton actually sold Mama's Family to Grant Tinker, the CEO of NBC at the time, on the golf course, with no pilot. So there we were, our writers had to figure out who the hell was Mama while we were right there on the ground. And I never really appreciated it until we sort of deconstructed the series and were doing the bonus features, and I never really appreciated how difficult the writing really was. My challenge for me was that Mama just didn't feel right We did like two episodes, and I remember looking at my husband, and thinking this doesn't seem right. We sort of shut the show down and I said "you have to bring Harvey in to help me." He was such a mentor, and I said "Harvey, what the hell's wrong?" And he said "well, she is this strident, one-dimensional character, and you can't expect people to come home and pop a beer every week and put up their feet if she's just in disagreement the whole half hour. They won't come back next week. You have to turn her into a sitcom character now, she has to be silly." And to that point, I said "I didn't feel like she'd ever smiled or laughed even." And he said "but you are her, and anything you can do, she can do." And for whatever reason, that speech that he gave me sort of set her loose and turned her into that fun peacock that she became. And literally, anything I could do, Mama did, and she became this really fun character of mine. There was really nothing the writers could throw at me that I couldn't do. SitcomsOnline: When you played the role of Thelma Harper, you were playing the oldest character on the series, yet you were younger than most of your fellow cast members, including those who played your own children. Did this present any unusual challenges for the series? 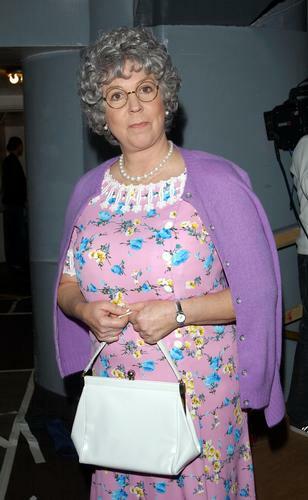 Vicki Lawrence: I don't. I've listened to everybody say that they think every single time I put on that outfit, everybody just sort of thought I was that old lady. And when watching the DVDs and photographs and everything from back in the day, I was so young. But everybody bought it! Yeah, I was younger than just about everybody on my cast, almost. But it worked, everybody bought it. SitcomsOnline: An interesting feature from the first two seasons was the introduction to the episodes from Harvey Korman as the character Alistair Quince, which until now have mostly been unseen since the episodes originally aired. What was the inspiration for these introductions, and why did the series choose to use these? Vicki Lawrence: Well, our writers thought it would be really funny to have Harvey introduce this dysfunctional family like it was Masterpiece Theater, so that was definitely an element of the network shows that was phased out by the time we went to syndication. Our fans, when the first season got released by Warner Home Video, a number of years ago, those were cut, because when we went into syndication, the show is shorter than the network version. They cut those out for fans. Our fans knew that and knew every single detail that was missing. TimeLife does and excellent job of putting everything out there like it should be. They went into Joe Hamilton's vaults, got everything, and it is as it should be this go around. So fans should be happy. The Warner Home Video one got panned on Amazon! One review after another, this is missing this and this is missing that. The fans remember more than I do, so they'll love this. SitcomsOnline: When the series was reborn in syndication, you were going into uncharted territory. There had been a few syndicated series before Mama's Family, of course, but most of them did not stand the test of time and few (if any) have made it to a deluxe complete series DVD set. How surprised are you that this series not only stood the test of time, but in fact became even bigger after leaving NBC? Vicki Lawrence: I'm extremely gratified that we were actually that popular. I guess as it turned out, we were really a lot of peoples guilty pleasure, and who knew? I knew Mama is popular, and it really became clear after the first Carol Burnett reunion that everybody just loved anything Burnett. And I remember Harvey saying to me that I really need to put a show together. And it never ceases to amaze me how many fans we have, because really when we went to first-run syndication was when we really hit our stride. I said to my husband several times that "I guess, America knows all of these shows now." Back in the day, there were only three networks and that was all you saw, and when we went into first-run syndication, that was really the beginning of cable and the beginning of first-run syndication. There was nobody doing that except for Too Close for Comfort, the only other sitcom doing it when we were in development, and I remember going to a studio where there wasn't a lot going on, and I remember driving in there the first day and thinking "OK, if Ted Knight can do this, we can do this." We worked in a vacuum, we were like little orphan children. We weren't recognized by the Academy, it was almost like we weren't in show-business. We did our little thing, there was no meddling… the Lorimar-Telepictures guys were busy selling the show so they didn't have time to meddle with it. We'd send them an episode, they'd send us a check. So in that respect, it was a lovely way to work, but it was strange to not be recognized by the television community. I think it was many years later that Buffy the Vampire Slayer caused such a huge stink that they had to open up the Academy, and you see what has happened. Nothing like it used to be. Vicki Lawrence: It seems that you still enjoy playing the role of Mama, and we're still seeing that character on talk shows and stage performances. So what is next for Mama? SitcomsOnline: Well, we'll see. Maybe something lovely will come out of the DVD sets. I don't know. There have been some people who've had some really fun ideas, but nothing has happened yet. In the meantime, I'm on the road with "Vicki Lawrence and Mama: A Two Woman Show," and she is definitely half of that show. It has been really fun to push her out of the closet and bring her into the new century, and let her comment on everything going on in the world. 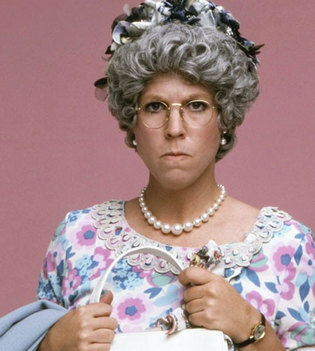 We are deeply appreciative of Vicki Lawrence for taking a little time to talk to us, and we encourage fans of her work to check out StarVista Entertainment/Time Life's release of Mama's Family - The Complete Series (read our review). 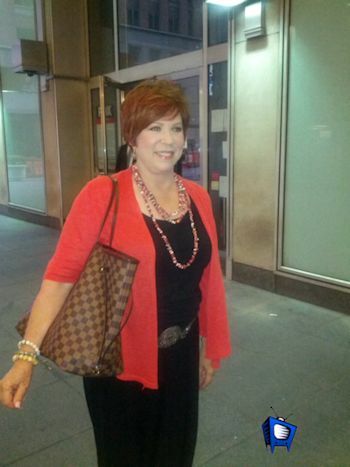 Here are a few other links to find out more about what Vicki is up to today, including upcoming speaking engagements and performances of her show, "Vicki Lawrence and Mama: A Two Woman Show:"
Charmed is getting a new TV home again. The hit supernatural drama is now coming to Lifetime starting today (Monday, Sept. 30)! The series will be shared with TNT, which will continue to air the series in the mornings, while Lifetime will air it in the afternoon. Charmed will air weekdays at 3pm & 4pm on Lifetime and will actually start off with season eight episodes before moving on to season one. Lifetime is picking up the rights from WE tv who didn't renew their contract. This is the perfect time for Lifetime to air Charmed, since they are about to launch its new original supernatural drama Witches of East End this coming Sunday (Oct. 6) at 10pm starring Jenna Dewan Tatum, Julia Ormond, Rachel Boston, and Mädchen Amick. It also is perfect timing because Charmed star Alyssa Milano is the new host of reality series Project Runway All-Stars, which will begin airing Thursday, Oct. 24 at 9pm on Lifetime. Double the whammy! Charmed will air after Grey's Anatomy, which will air at 1pm & 2pm. The weekday line-up begins with Old Christine from 8-9am into Frasier from 9am-12pm. How I Met Your Mother will continue to air from 12-1pm. Charmed ran for eight seasons from 1998-2006 and starred Alyssa Milano, Holly Marie Combs, Rose McGowan, Kaley Cuoco, Brian Krause and Shannen Doherty. Households: #1. CBS 7.7/12 rating/share (-3% in rating from first four nights week 1 in 2012); #2. NBC 6.3/10 (+37%); #3. ABC 6.0/10 (-10%); #4. Fox 3.8/6 (-10%); #5. The CW 0.5/1 (+25%). Total Viewers: #1. CBS 12.3 million (-3%); #2. NBC 10.17 million (+41%); #3. ABC 9.41 million (-8%); #4. Fox 6.21 million (-11%); #5. The CW 776,000 viewers (+25%). Adults 18-49: #1. NBC 3.2/9 rating/share (+28%); #2. CBS 3.0/8 (-3%); #3. ABC 2.7/8 (+4%); #4. Fox 2.2/6 (-15%); #5. The CW 0.3/1 (even). It's a new season, and a new format to the weekly ratings report! It might be a bit more cleaner, but we are working on tweaking this and making it even better. So bare with us! By week two, you'll have actual week-to-week comparisons for most programs. So read our full night-by-night analysis followed by how the sitcoms did!